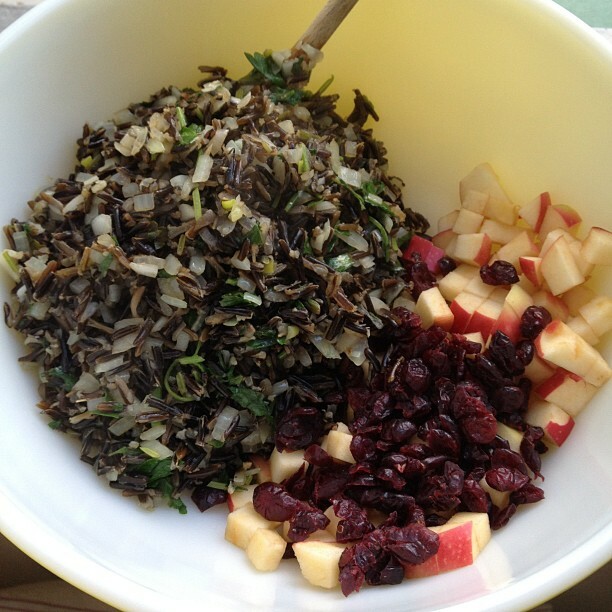 I invite you to try this dish because well, it’s a little different and for the mere reason that I haven’t liked wild rice in the past but prepared this way I found it heavenly. Perhaps you already have an affectionate relationship with wild rice, than you will really enjoy it. The last time I prepared it, it was tough and probably only partially cooked, so we should blame my dislike on ill preparation. I bought this wild rice at Trader’s Joe’s because I’m convinced they could get me to like anything where no fondness had existed. After months of hanging out in my cabinet, much like the barley, I resolved to use it last night. We happened to be running low on veggies which added to the eccentricity of the ingredients. To my great relief, it was not only palpable but delicious! A word of note, in Portland we are experiencing beautiful 60-mid 70 degree weather with a mix of clouds and the most brilliant blue skies. Due to the nice comfortable temps, cooking a meal like this came natural. While eating I paused to think about those family and friends in IL that are experiencing anything but cool temperatures. I found it hard to imagine craving a warm rice dish with baked tofu. The last thing I’d want to do is be in the kitchen with the stove and oven blazing in 100 degree temps. You’d find me outside in a lawn chair with friends, a beer, and a Popsicle or a watermelon. Say you are willing to brave the kitchen, this could be made ahead of time and chilled for a few hours, I think it would make a lovely chilled dish. Once the tofu has been pressed and drained whisk the sesame oil, tamari, rice vinegar, and mango juice in a container shallow enough and then lay the pieces of tofu down, ensuring they all get covered in the marinade. Marinate for 30 minutes to 2 hours. Time the next step with your rice finishing although it won't hurt the tofu or the dish, if the tofu is cold. Place the tofu on a baking sheet covered in parchment paper or tinfoil and bake for 20 minutes in an oven preheated to 370F, flipping at the 10 minute marker. Then turn the broiler on and broil 10 minutes a side or until desired crispiness. Ours had nice crispy edges and soft middles. Prepare rice according to package instruction and set aside. In a medium sized sauce pan add the olive oil and heat on medium. When oil is hot add the minced garlic and onion and saute for 2-5 minutes until the onions become slightly transparent. Add the rice to the onion garlic mixture along with the garlic powder, cinnamon, salt, balsamic vinegar, parsley, and cilantro. Toss to mix and evenly distribute while sauteing another 2-3 minutes on medium heat. While that is happening add the diced apple and cranberry to a large bowl, once the rice mixture is done add it to the large bowl containing the apple and cranberries and toss to mix. 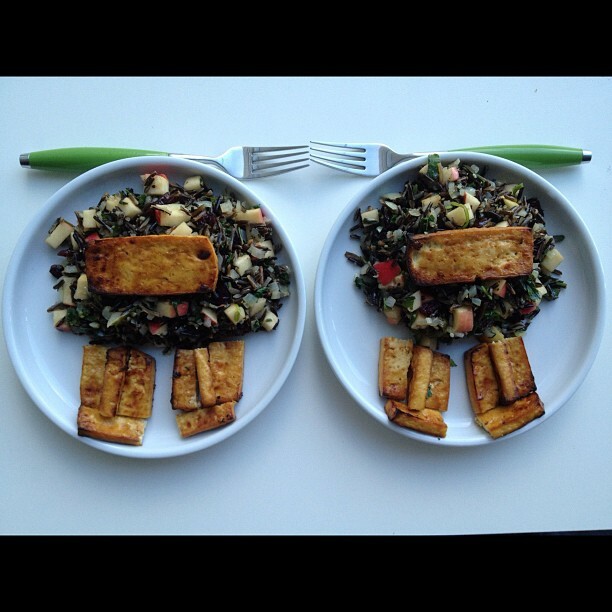 Serve with the tofu and enjoy! Enjoy! How do you like your wild rice? What Do You Do With 10 Pineapples?